The earliest Church documents that describe the Eucharist show differences in the way it was celebrated from region to region. Rome, Jerusalem, Alexandria, Antioch, Milan, Gaul — all of these centres of the Church had different ways of celebrating the Eucharist from the earliest days. And yet, there was never a question that it was the same Eucharist, the same Sacrifice, the same faith, and the same Apostolic foundation which underlay them all. Even within the area encompassed by the Roman Rite, there had been considerable variation in the celebration of the Mass over the centuries. The Council of Trent endorsed some of this diversity, as well as called for greater centrality in promoting uniformity. Popes from the fourth century through the twenty-first century have made changes for the sake of adapting or reforming the Roman Rite, but all of these changes must be seen not with “the hermeneutic of discontinuity and rupture” but within “the hermeneutic of reform, of renewal in continuity” as Pope Benedict XVI teaches. It is in this light that Blessed John Paul II, with a special indult Quattuor abhinc annos,issued in 1984 by the Congregation for Divine Worship, granted the faculty under certain conditions to restore the use of the Missal promulgated by Blessed John XXIII. He then promulgated the motu proprio Ecclesia Dei in 1988 which established a Commission for the pastoral oversight of those Catholics who remain attached to the Mass as it was celebrated in the Missale Romanum of 1962. 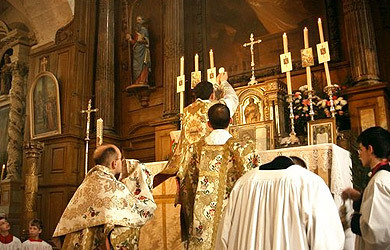 In 2007, Pope Benedict XVI issued another motu proprio, Summorum Pontificum, which expanded and simplified the permissions to celebrate the whole liturgy according to the norms of 1962.He has clarified that the 1962 Missale and 2008 Missale are both legitimate forms of the one Roman Rite, respectively called the Extraordinary and Ordinary Forms. Thus does he exhort the whole Church to “generously open our hearts and make room for everything that the faith itself allows.” Any priest of the Latin Church—provided he has the minimum rubrical and linguistic ability—may, without any further permission from the Holy See or his Ordinary, celebrate the Extraordinary Form of the Missale Romanum in a Mass without the people at any time except during the Sacred Triduum. 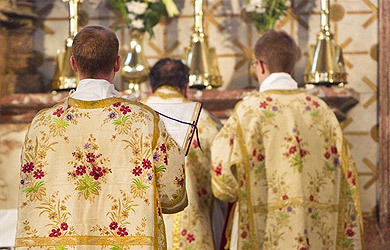 If members of the faithful wish to join in these celebrations, they are permitted to do so.In parishes where a stable group of the faithful are attached to the Extraordinary Form of the Mass, they may approach the pastor, who is to support their petition willingly. It is not certain what the future holds, but for the present the Pope hopes that the two forms of the one Roman Rite may provide a mutual spiritual enrichment for the faithful and promote the Communion of the whole Church as an expression of unity in diversity. In the Diocese of Lancaster several priests celebrate Mass in the Extraordinary Form. 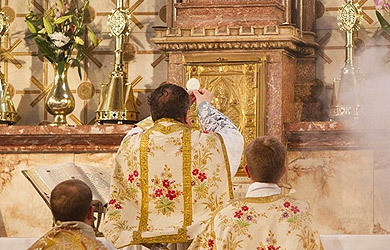 Advertised Masses in the Extraordinary Form within the Diocese can be found on the Latin Mass Society website here and outside of the Diocese here. Bishop Campbell, in September 2014, established a Shrine for prayer and worship exclusively in the Extraordinary Form ran by the Institute of Christ the King Sovereign Priest at St Walburge’s, Preston. A further shrine church was similarly established by Bishop Campbell, under the care of the Institute, in September 2017 at English Martyrs, Preston.